TVonics appoints Bell Advisory LLP as administrator | What Hi-Fi? TVonics, the Wales-based manufacturer of Freeview set-top boxes and PVRs, has appointed Gary Bell of Bell Advisory LLP as administrator to the company. A statement on the company's website says: "The affairs, business and property of the company [TVonics] are being managed by the administrator who acts as an agent of the company and without personal liability." The website appears to be still trading as normal. 10th Floor, 3 Hardman Street, Spinningfields, Manchester M3 3HF. TVonics was founded in Wales in 2004, and is based at the old Sony TV plant in Pencoed. While many other suppliers of set-top boxes buy in OEM models from China, it maintained its manufacturing base here in the UK, and became the original supplier of set-top boxes for the Government's digital switchover help scheme, with boxes designed with features such as audio description, automatic retuning and a remodulator to allow it to be used with older TV sets having only an aerial input. 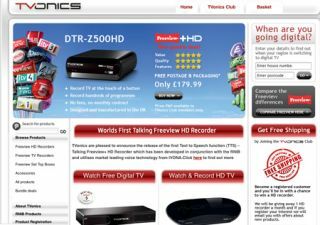 The company started life as TVonics Ltd, but went into administration in 2008. Bought by the Contacts Holding Group, it was relaunched as TVonics Solutions Ltd.